As a fan of dystopian fiction, I'm always on the lookout for new stories that stand out from the sea of dystopians out there. After reading Dan Well's Partials, I can finally say "well this is different". 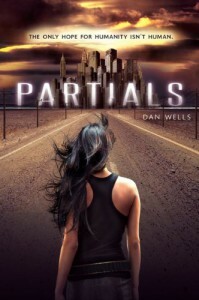 Even though it was a slow start, Partials snuck up on me when I least expected it, and took me for a wild ride. The combination of a badass heroine, funny and likable characters, a unique plot, plus enough scientific data and hypothesis to bring Biology 101 flashbacks, makes for a very entertaining and believable book. I found myself in the heroine's shoes quite a bit, getting into her brain and trying to figure out things alongside her. Kira, the main character is a very strong individual, with a very clear idea of what she wants and how she is going to get it. Kira is one of just thousands of humans left in the world after a virus called RM wiped out 99.9% of the population. The survivors have gathered and made a home in Long Island, NY, where they have been for the last eleven years staying away from the Partials. The Partials are genetically engineered humanoids that humans created for the purpose of winning a war as soldiers, only once the war was won, the Partials turned on the humans and attacked and are believed to have created and released the RM virus that wiped out most of humanity. While the humans only have Long Island to call home, the Partials have taken over the rest of the world. The worst part is that the humans that are left, the ones who survived because of an immunity, are able to reproduce but as soon as a baby is born he or she dies within hours or days from the same virus. With babies dying and the humans that are left getting older, humanity is facing extinction. Kira is a medic and an idealist, and formulates a plan to find the cure for RM, unleashing a slew of events that will give you whiplash. Just when you think you have things figured out, something else pops up that makes you question everything and you just don't know who's good or bad until the heat is too much to take. This book does not disappoint. I think what I liked most about it was how in tune I felt with the main character. I was able to follow her train of thought and come to the same conclusions that she did. Whenever I would think that something was off or didn't fit, she would also point out the same thing in the next line or two. I truly identified with her. The rest of the characters didn't disappoint either. No love triangle, no passionate scenes, and yet I couldn't tear my eyes away from the pages. This is most definitely a 5 star read for me and I just can't wait to see what Dan Wells has for us on the second book.